The 5″ Android device will suit the mobile needs of industries such as retail and hospitality, emergency services, manufacturing, and transport and logistics. With its voice and data capabilities, integrated barcode scanner and wide range of functionality and accessories, the Toughbook FZ-T1’s balance of mobility and durability is set to improve workforce productivity and the ease and efficiency of business operations across Australia. The Toughbook FZ-T1 handheld will be available in a 4G model, with voice and data capabilities. Built for the needs of the modern mobile worker, the high-performance device has the Android 8.1 Oreo operating system, a Qualcomm Snapdragon quad-core CPU, 16 GB Flash and 2 GB Ram storage. Light and slim, the Toughbook FZ-T1 weighs under 240 g. It is designed for military standard 810G, dust and water resistant to IP68, tumble tested and capable of withstanding drops of up to 1.5 m, and operating within a temperature range of -10 to +50°C. With an easy viewing 5″ display, the Toughbook FZ-T1 has 10-finger input, daylight-readable screen, is capable of operating in the rain and can be used with gloved hands or an optional passive pen. It has an enterprise-class, straight-line barcode reader built in with two trigger buttons (either side of the device) to make it easy for left- and right-handed operators. These accessories are suitable for operators scanning regularly, or needing to scan at a distance in warehouses or while operating forklifts. Designed to operate a full shift, the Toughbook FZ-T1 comes with a 12 h battery life and warm swappable functionality, allowing the user to switch their own batteries without interrupting work. For clear communication in busy work environments up to construction site noise levels, the Toughbook FZ-T1 is equipped with noise suppression technology and loudspeaker. It also has an 8 MP rear camera for easy document capture. 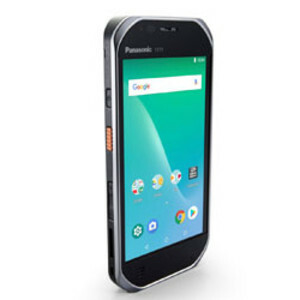 I am interested in Panasonic Toughbook FZ-T1 handheld device .